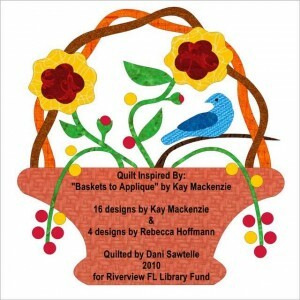 A little bird told me that my new book Scrap-Appliqué Playground is a guest star on this week’s Part 3 of Quilt Out Loud! 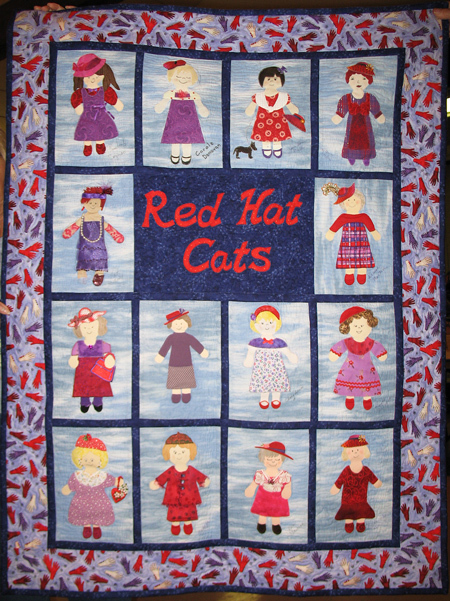 Have you seen Quilt Out Loud? If not, then be sure to check out this lighthearted, fun-filled internet TV show hosted by Jodie Davis and Mark Lipinski over on QNNtv.com. The segments are free to watch for a week following their debut, so give it a whirl! P.S. Mark obviously did not read the caption in the book for my Studio quilt LOL! 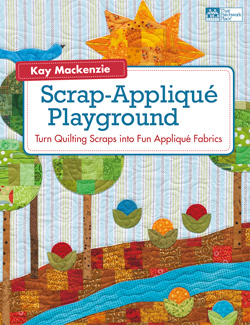 Tuesday was the Official Publication Day for Scrap-Appliqué Playground. Happy dancing, happy dancing! It doesn’t get much more exciting for an author than that! I’m so excited that today there’s a post by Karen Johnson of the marketing team, in which she recounts her eagerness to visit the Playground, and the fun she had on her first trip! I couldn’t love it more. It’s so cool, you have to go and see. Not only that, they’re giving away a copy of the eBook hot off the digital presses! My copies are en route, in fact Brown should be paying me a visit later today. Just as soon as I have them in hand I’ll be updating my website, hopefully as early as tonight. They’re here! 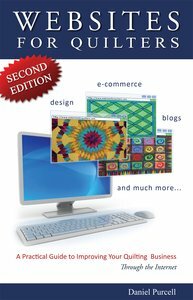 The new book is now available on my website, kaymackenzie.com! Martingale sent me this button. Notice the new birdy logo. Very cute. It got me thinking. Well, the larger shows often provide signage, but the smaller ones usually don’t. Hmm, I said to myself. 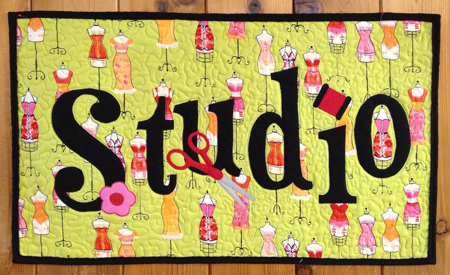 Other vendors have really cute quilted signs, maybe I should have one too. So I sat down and sketched out an idea for something simple but graphic. I’ve been working on it the last couple weeks and just finished it up. P.S. 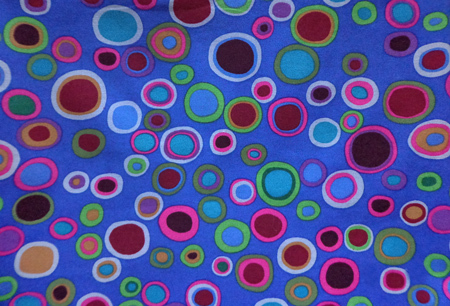 The $5 off any order of $10 or more is still on at the website, through December 10! The code is 5OFF. 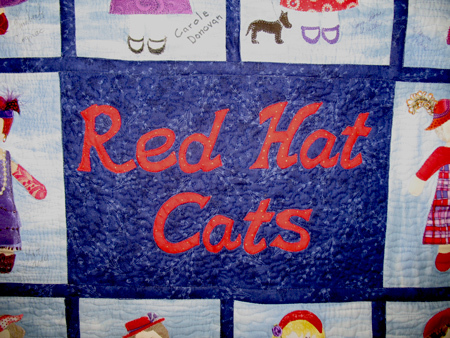 Over the weekend I was in Reedley, California, for their semiannual quilt show. Reedley is not far from Fresno. That’s right, Fresno, where the hot sun turns grapes into raisins. It was 99 degrees on Friday. My neighbor Donna and I nearly suffered heat prostration trying to get everything loaded in and set up. 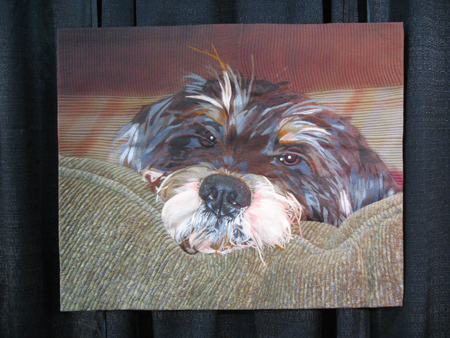 I was delighted to be there, though, because the amazing Janice Whittington was one of the featured artists! 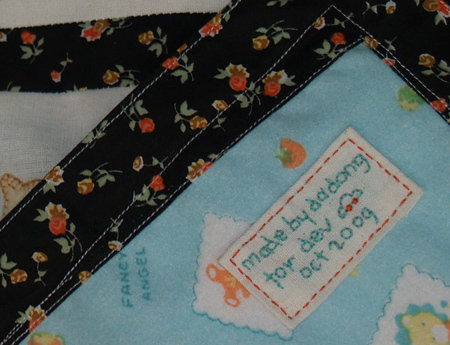 Jan’s daughter Shamara runs Second Chance Fabrics, a genius concern that rescues unused fabric out of quilters’ stashes and gives it a second chance! 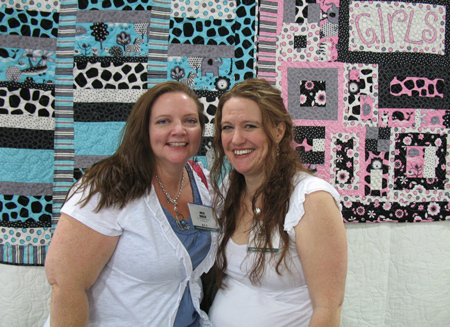 Jan helps out at the booth at shows, and mom and daughter have become buddies of mine. 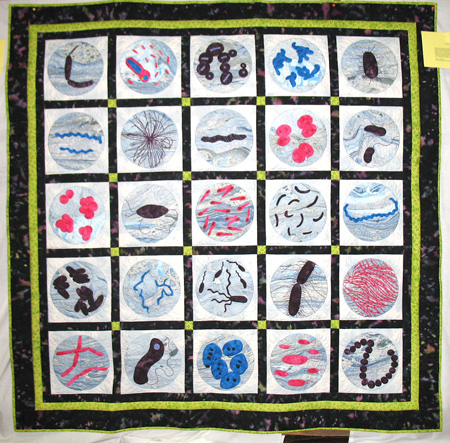 Part of Jan’s display was a collection of Biology Quilts. Let me see if I can get the story straight. Jan’s husband Nathan, Shamara’s dad, is a high-school biology teacher. When they moved to a new building, the high ceilings made the room echo. Plus, the articulated cow skeleton couldn’t come along, so the space that had been dedicated to it in the new classroom was now bare. On top of that, the school administration sent down a decree that there could be no nails in the new walls. 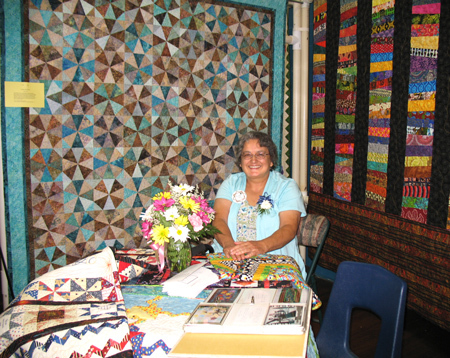 Now you know what a quilter does with bare spaces and echoing halls. 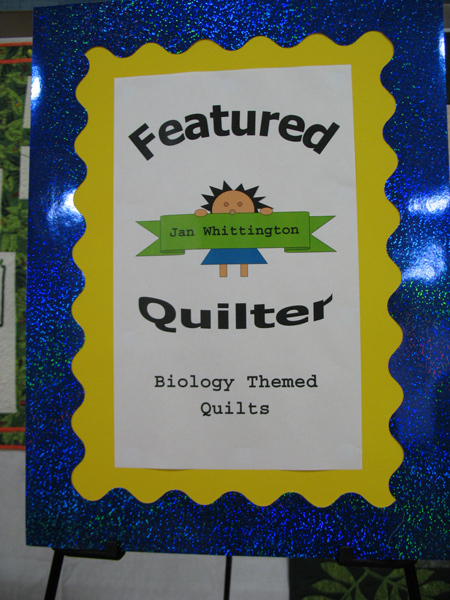 Jan immediately started on a series of quilts to go in that new classroom. The rebel in her came out. She went down there herself to put the nails in the walls. “They’re not MY boss,” she says LOL! 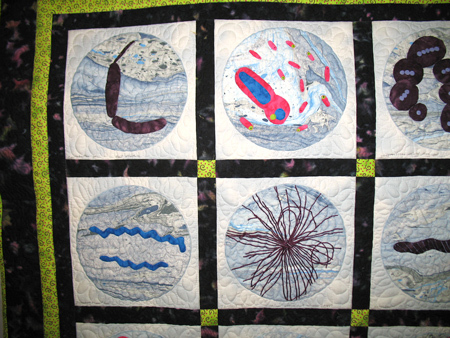 Here are some of the pieces in her amazing biology series. Inspired by her husband’s many coastal class field trips. 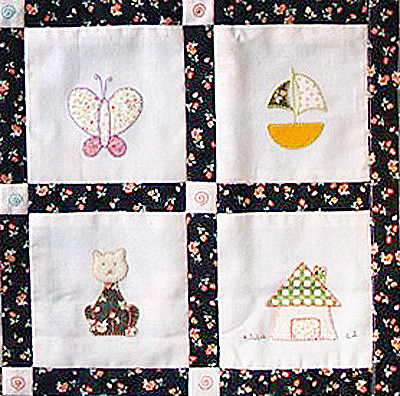 The first quilt Jan made to help baffle the echoes. My personal favorite. 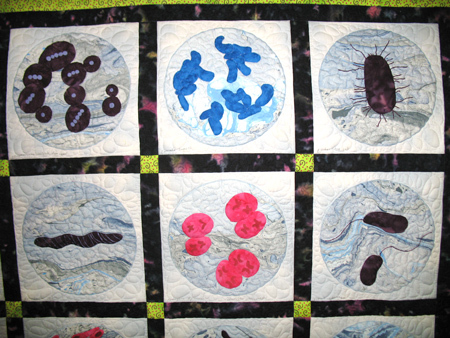 Now how many people do you know who’ve made a bacteria quilt? 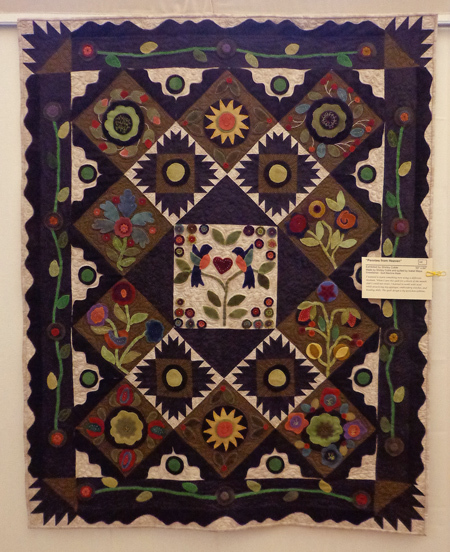 Here’s another of Jan’s quilts that I just loved. 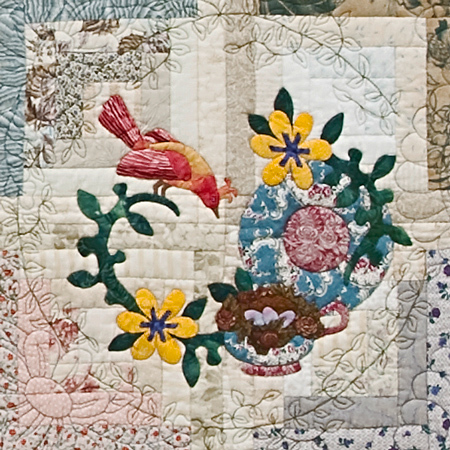 From the Aztec Rose Garden pattern by Colette Belt. 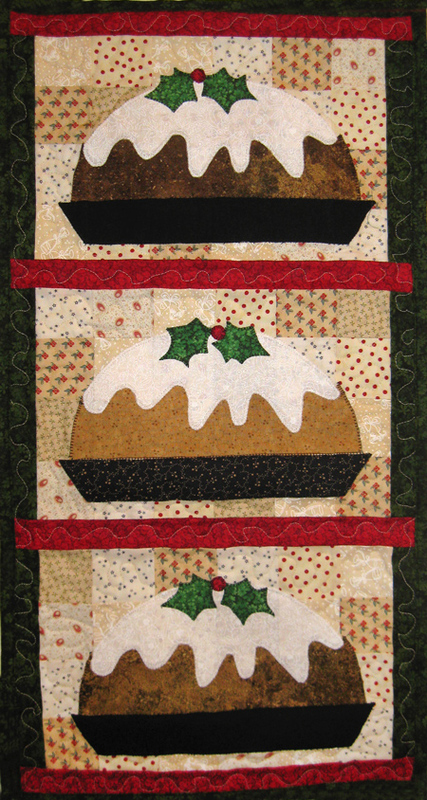 Longarm quilted by Cynthia McGunigle of Mac Quilting, Fresno. 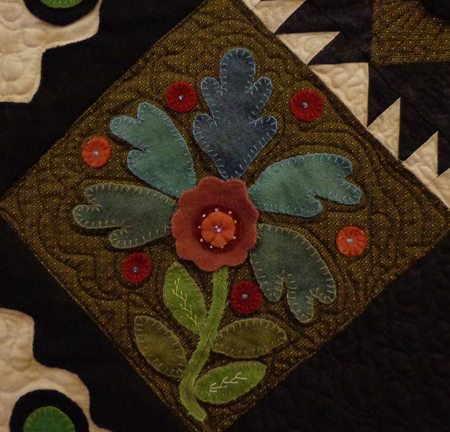 Beautiful pattern, beautiful colors, beautiful appliqué. By Sunday the temperature had gone down to “only” 85. The local residents said they were grateful for the cool weather. 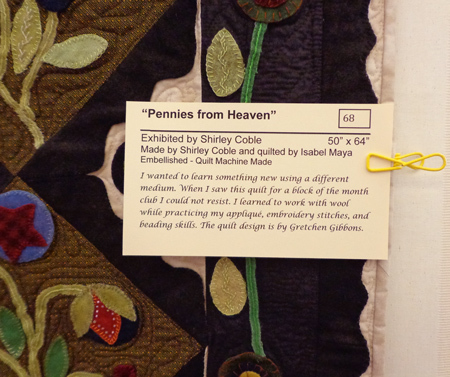 Before the lights went out in San Diego, I was tromping up the aisle, and someone was taking a picture of a quilt. Naturally I turned my head, and then I put on the brakes hard. 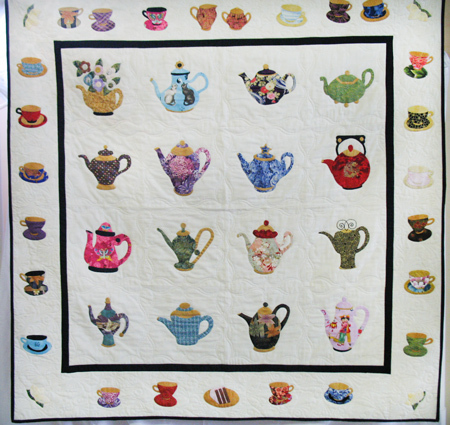 I can spot my teapots at 50 paces! 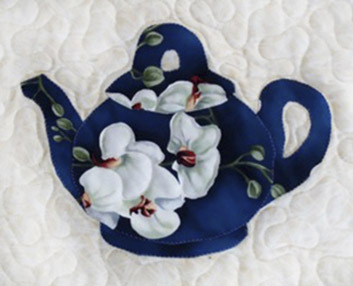 There was the most glorious oriental teapot quilt. I stood there with my jaw on the floor. 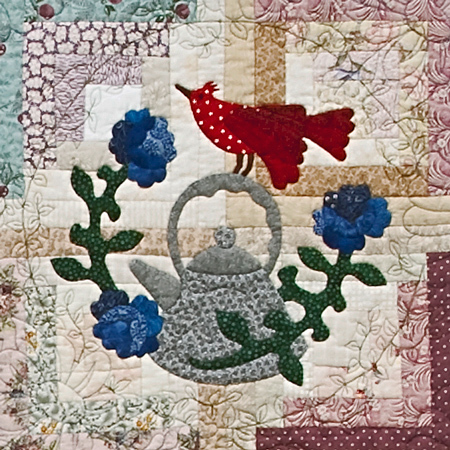 Most of the teapots are from my Teapots 2 to Appliqué. I got the chance to talk with Marjorie a couple times during the show. 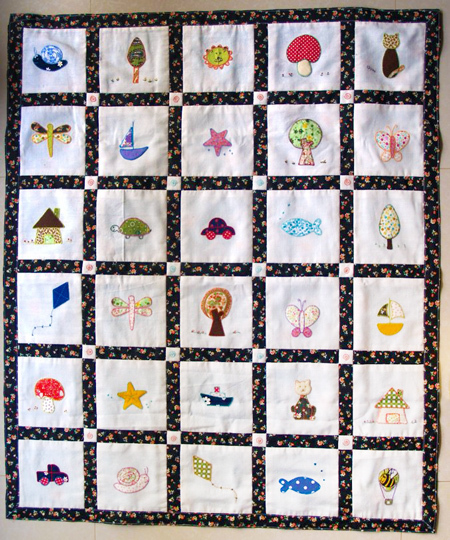 She was beaming with pride over her quilt and so was I. Here’s the story of this masterpiece, from Marjorie herself. 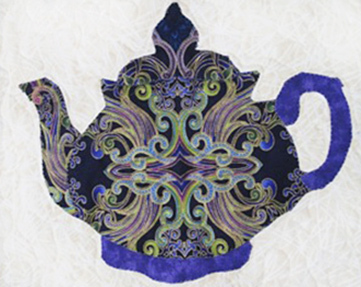 When I saw Kay’s book on teapots, I fell in love with it. However, I kept thinking “Are you crazy? 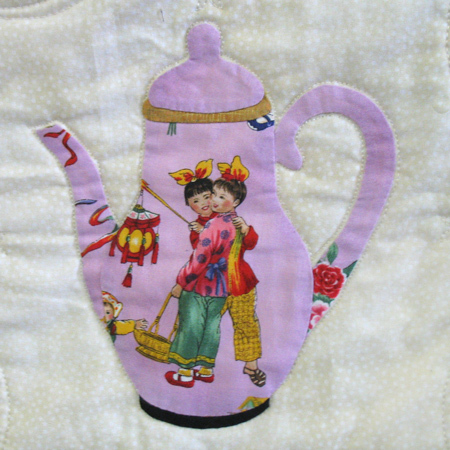 This is applique!” I collected oriental fabrics for about two years while I was trying to figure out how to display the teapots. 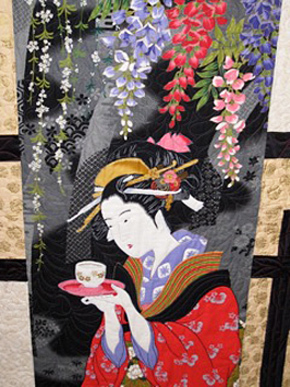 Then I found the center panel with the Geisha holding the teacup. 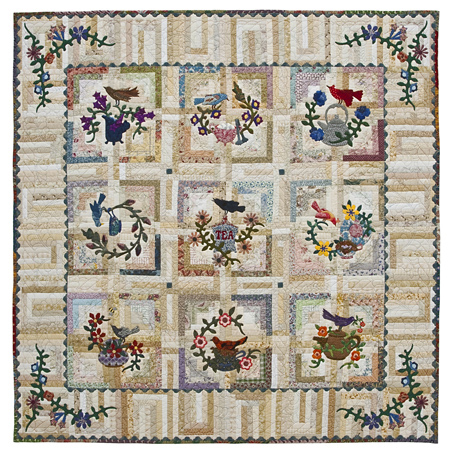 Next, I found the block pattern called BQ2 by Maple Island Quilts and it looked very oriental to me. I was ready to sew! 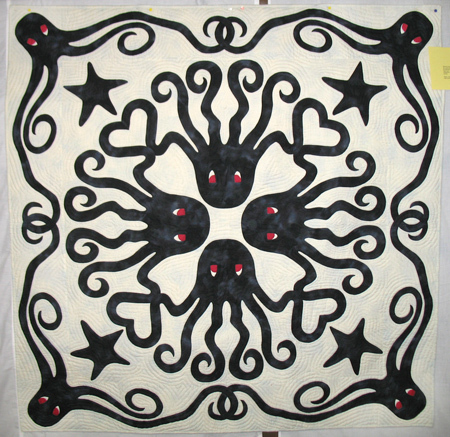 This was my second appliqued quilt. 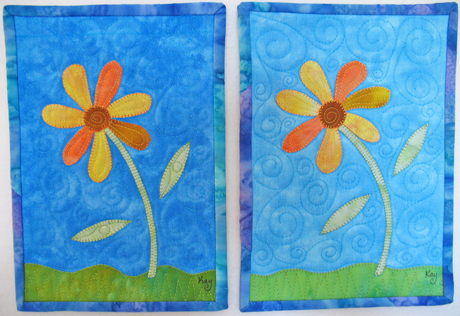 I used the directions in the book to enlarge the patterns by 150% so they would fit on a 12″ block. I used a freezer-paper method (ironed to the back) with spray starch to anchor the edges down. 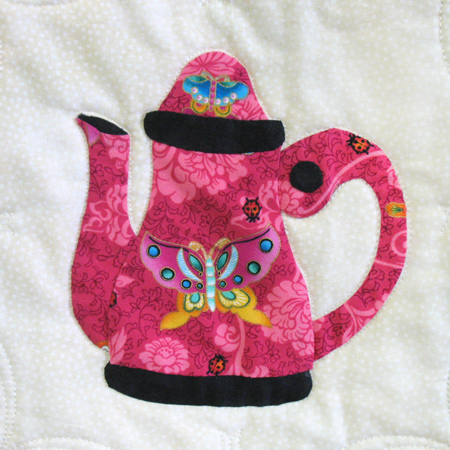 Then I used the liquid basting to adhere the teapot parts to the block. 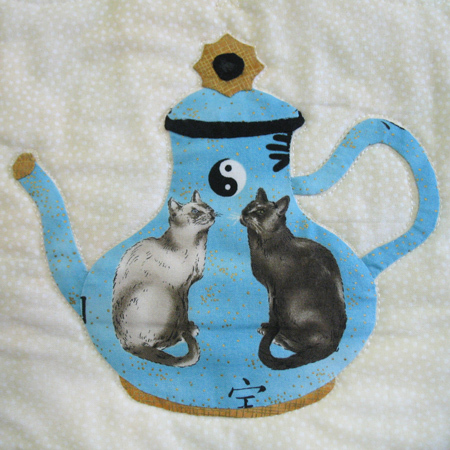 The final step was machine-stitching the teapots. 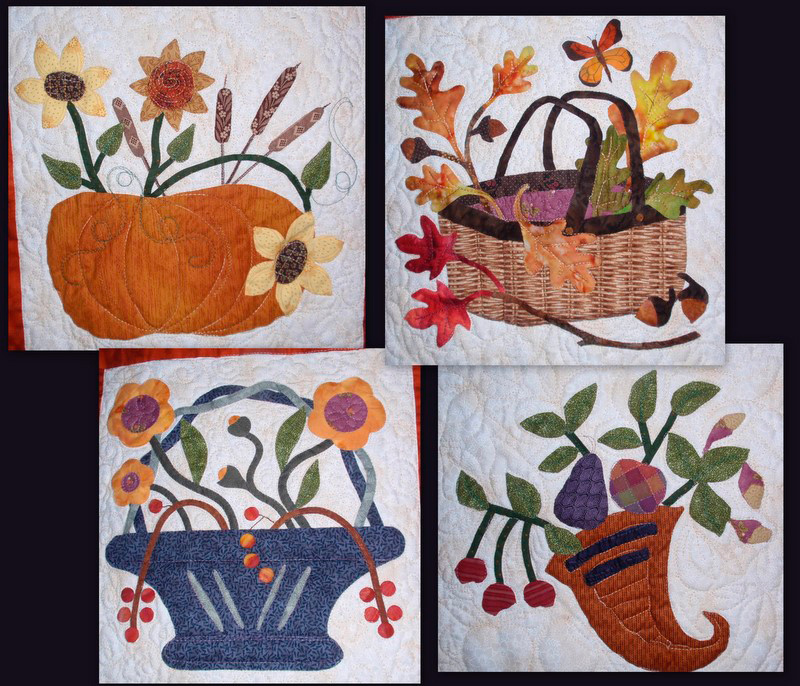 My husband designed three blocks for me too. The whole project took about four months. 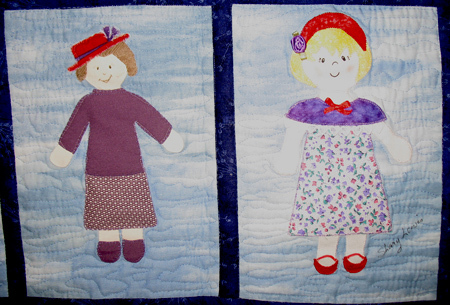 The quilter, Wendy Knight, did custom quilting. 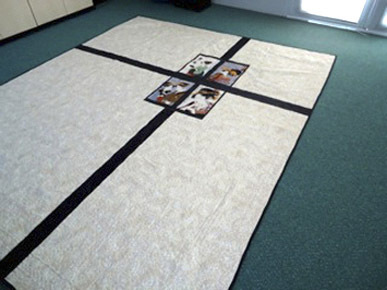 In the black horizontal strips are names of tea or words like ‘happiness’, ‘peace’, etc. 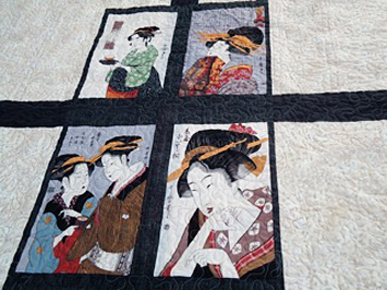 The vertical black strips have bamboo quilted in. 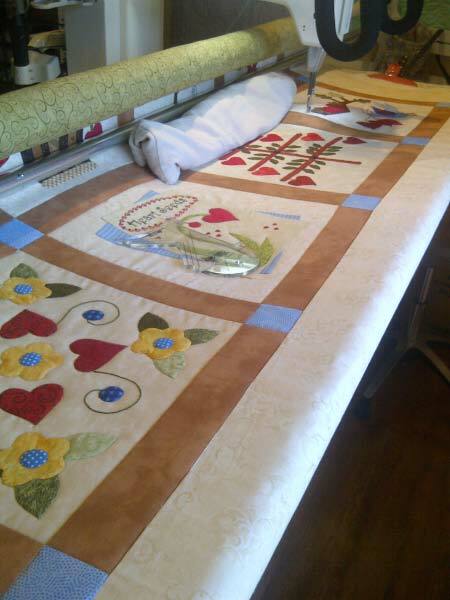 I had bought a large backing but still needed to enlarge it to make sure there was enough for the quilter. 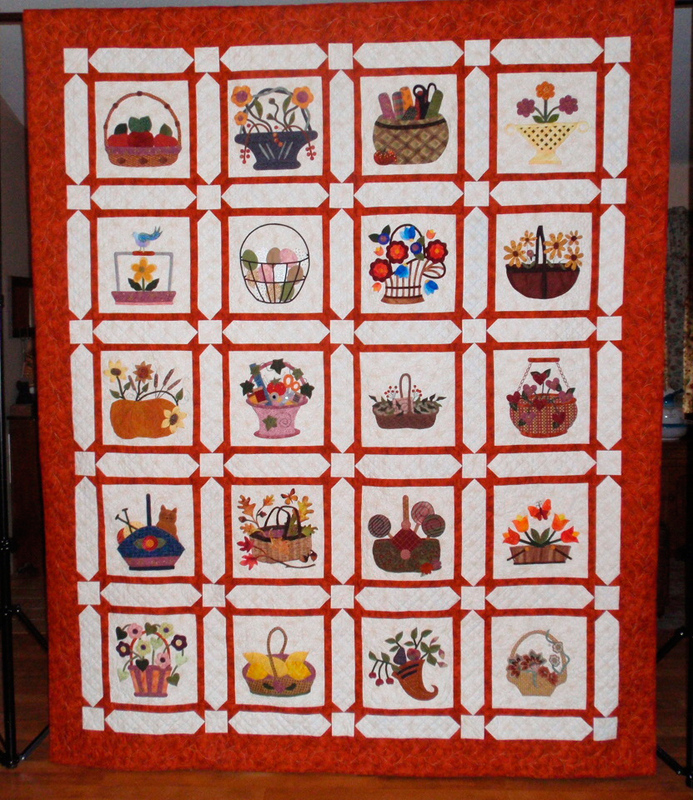 My husband helped me mimic the front design and we offset the black strips (instead of centering them) and then I used another panel that I found to add a decorative touch. 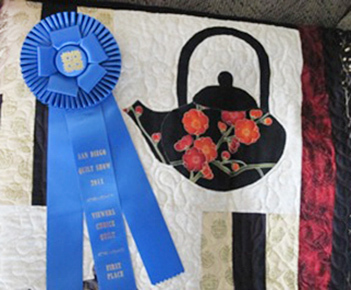 What Marjorie didn’t mention is that her quilt won First Place in Viewer’s Choice! 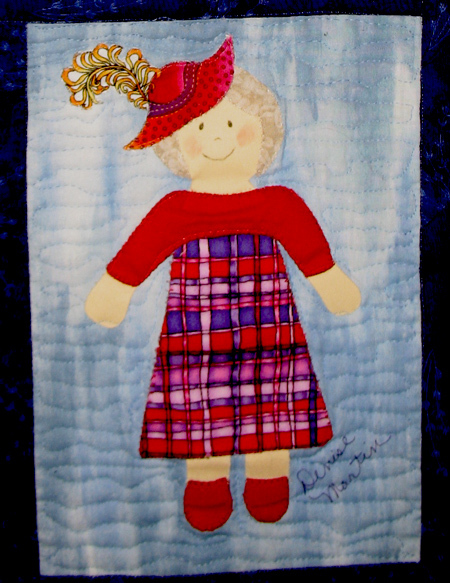 Welcome to the North Pole goes to… Debbie St. Germain! Congratulations! Debbie is a regular blog reader and reports that she has been trying to get this book from the library but apparently someone liked it a little too much to bring it back. She plans to use the designs for some Christmas things this year, so hopefully we’ll see some photos soon! But Debbie, no pressure :). 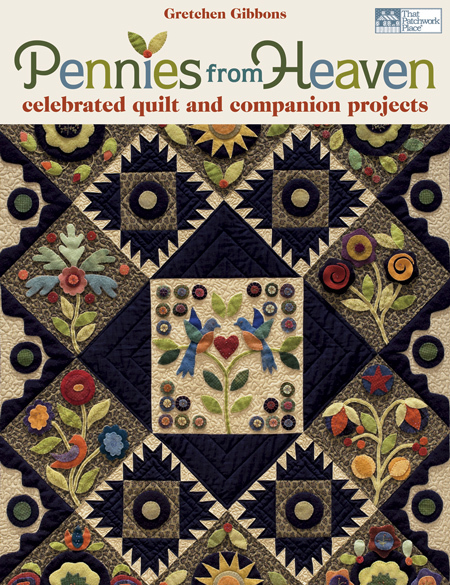 In other news, I’m about to embark on a busy spell of traveling to quilt shows. 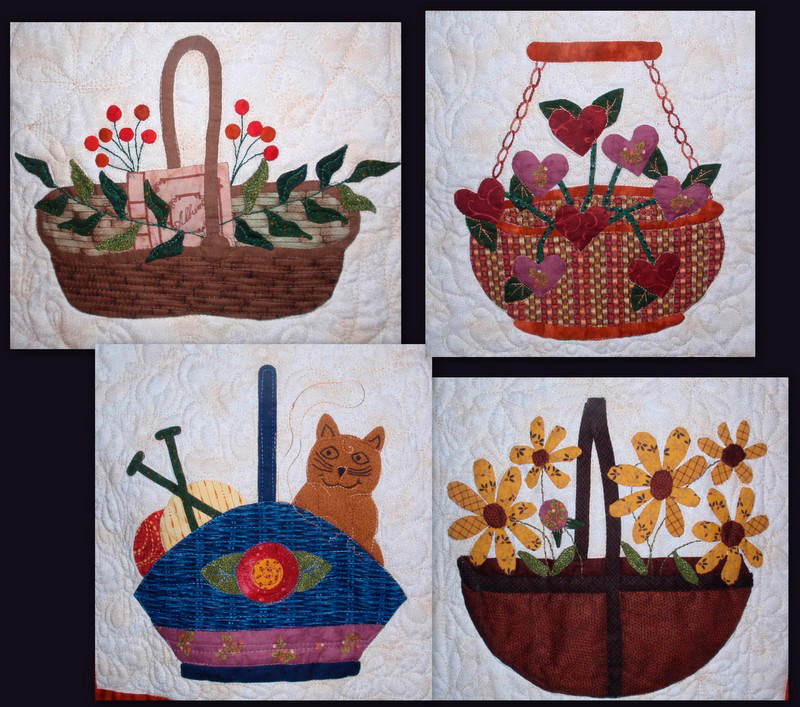 I just finished a couple of mini quilts made out of single blocks from my Baskets to Appliqué Pattern Pack to hang underneath the sampler quilt. 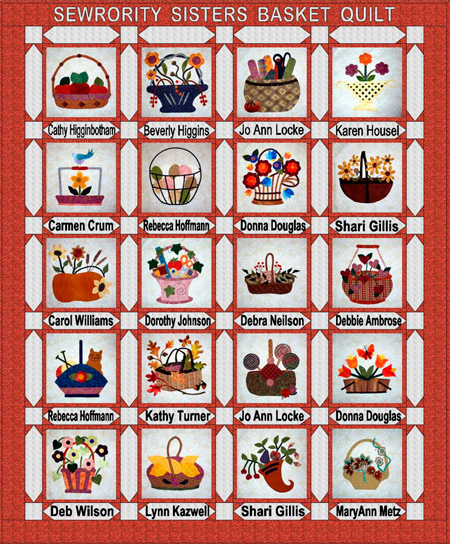 Knitting Basket. 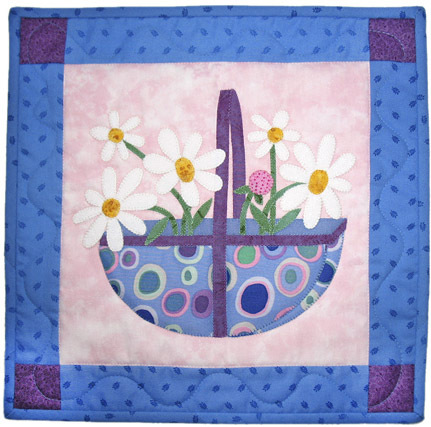 This one is actually a combination of two different designs. 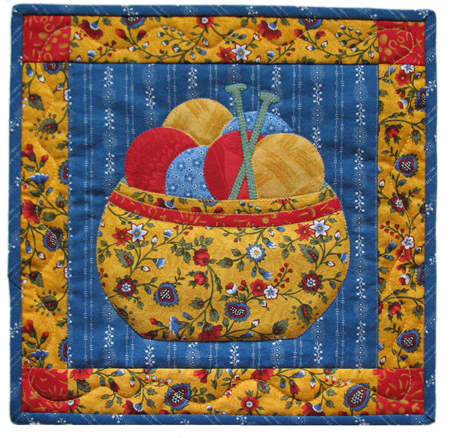 It's fun to mix and match the contents with the baskets. 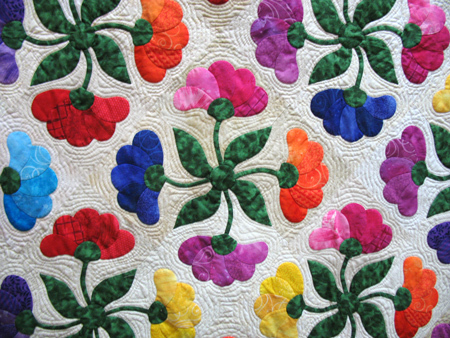 It’s the 30th annual show of the San Diego Quilt Association! The show is held at the beautiful San Diego Convention Center, right on the water. 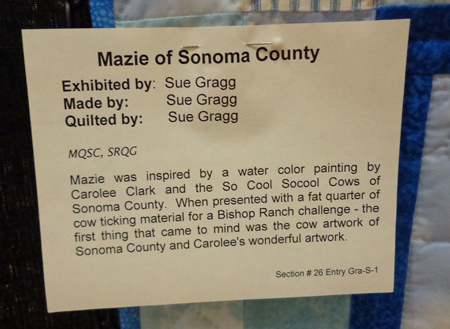 This is the Sierra Quilt Guild’s 22nd annual show, held at the Mother Lode Fairgrounds in Sonora, California. 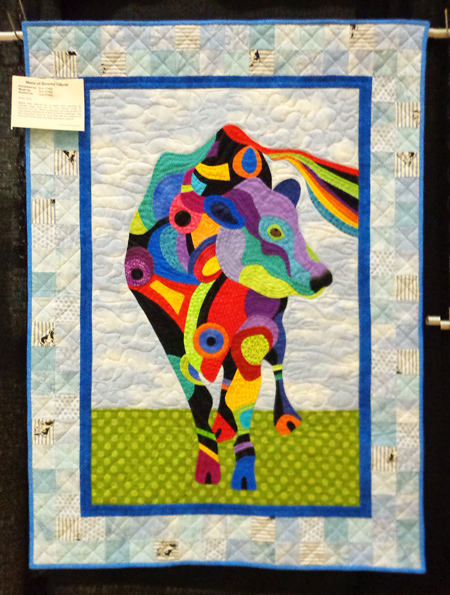 The Kings River Quilt Guild puts on this 300-quilt show in Reedley, California. I’ll be home in between times, so I hope to get a few posts in there. 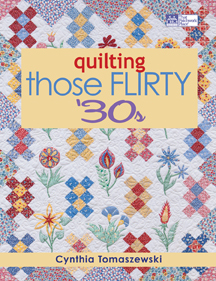 Next I went to see Cynthia Tomaszewski present her new book Quilting Those Flirty ’30s. 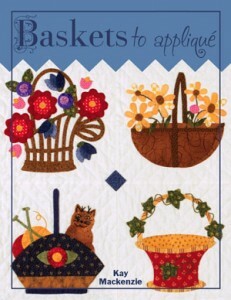 All the projects in this book are super cute, ’30s style, and all incorporate a touch of appliqué. I’ll try to get my hands on a copy of this book in the future. By then it was time for a little lunch. At Market you sit down wherever, and usually end up striking up a conversation with your neighbors. 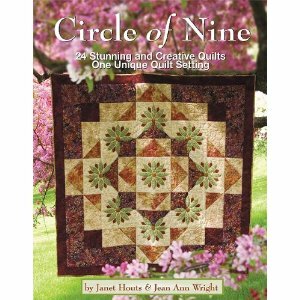 I started chatting with a couple gals and found out that they were sisters and co-authors of the new book Circle of Nine. 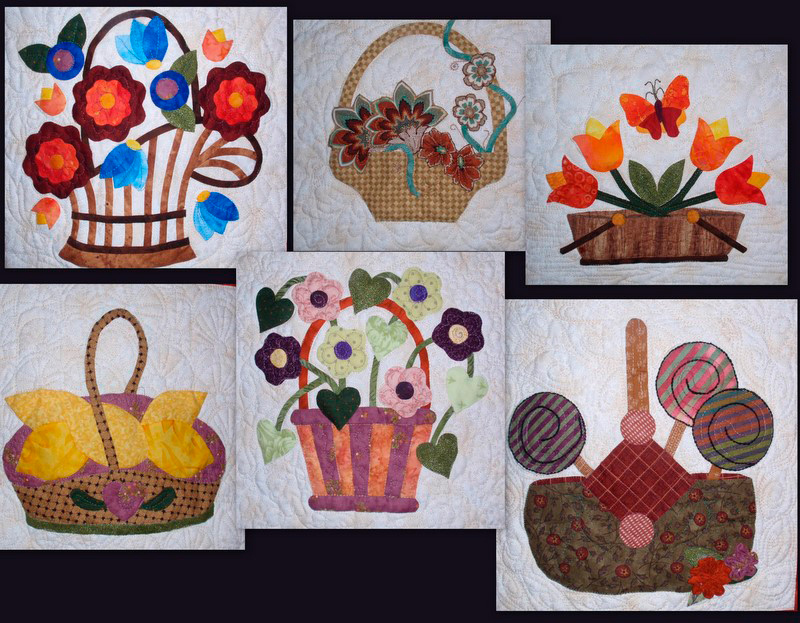 The subtitle is “24 Stunning and Creative Quilts: One Unique Quilt Setting.” A beautiful way to set a collection of nine blocks! 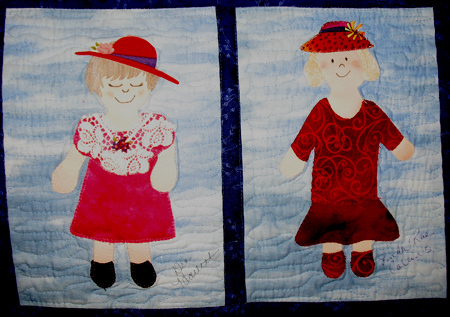 Holy cow, these gals are Janet Houts and Jean Ann Wright, who was editor-in-chief of Quilt Magazine for 20 years! What a great lunch! 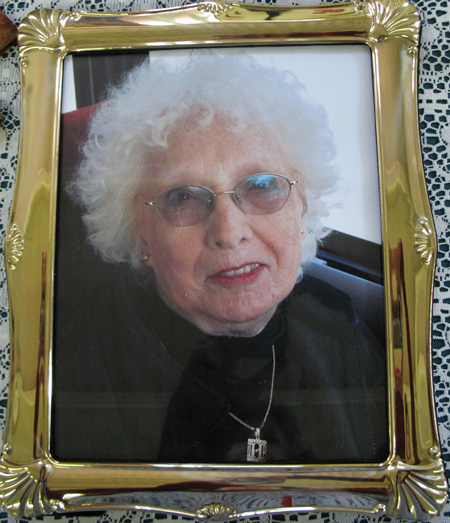 The Checker Distributors Newsletter has a lot of great photos from Market. 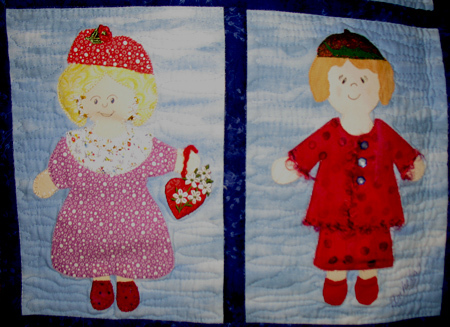 Pat Sloan also has fun Market recaps up on her blog, and recorded some radio interviews while she was there. More to come from me, including a lot of great information addressing some of the questions in the recent call for topics. 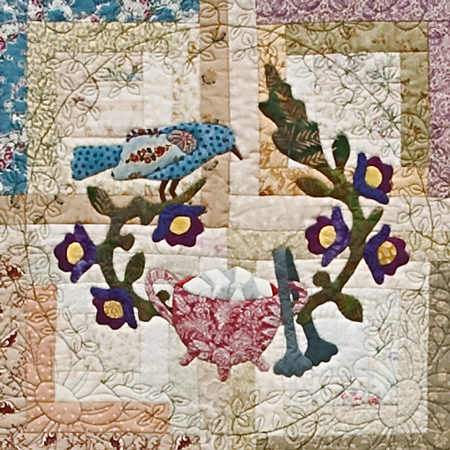 For those of you in the greater Los Angeles area, I’ll be in Northridge this weekend for Quilting in the Valley 2011, an annual show put on jointly by two area quilt guilds. 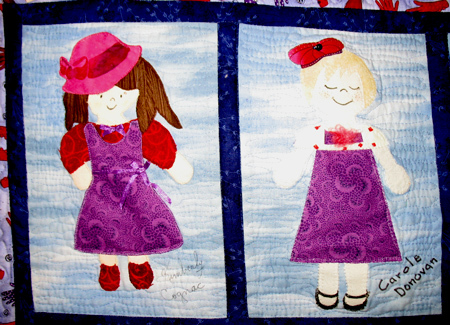 Full information at quiltinginthevalley.com. Hope to see you there! 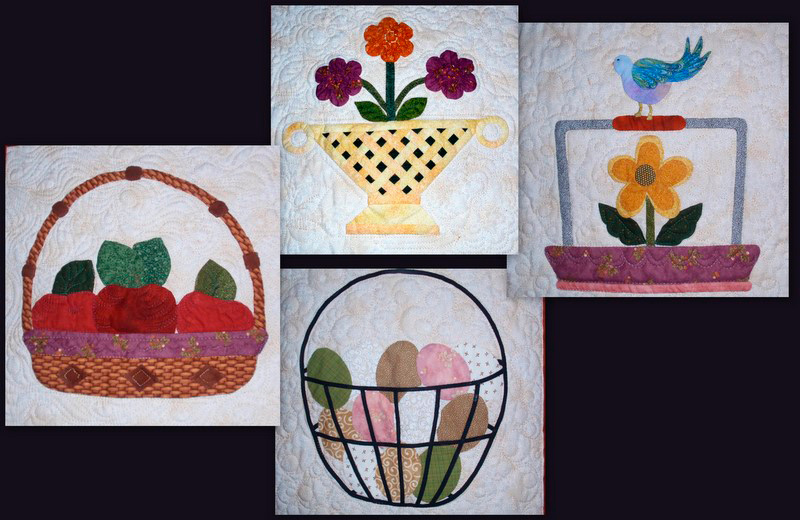 The winner of the Rose of Sharon Block Book and note cards is… Jen! Congratulations! 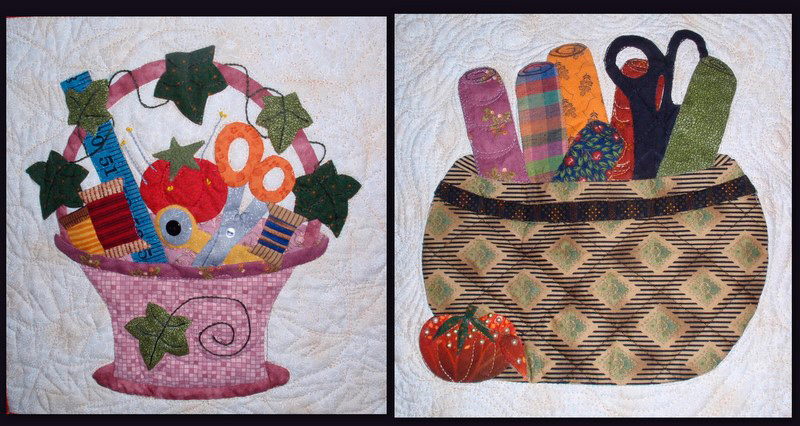 Enjoy these beautiful items, courtesy of That Patchwork Place. 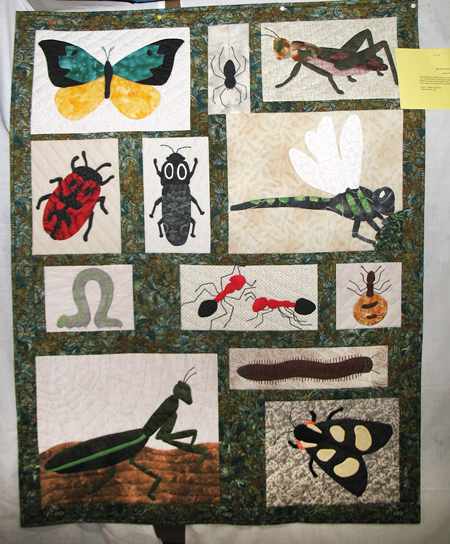 I’d now like to go back two weeks in time to the Delta Quilters Guild show in Antioch, California. I was there as a merchant, and after I finished setting up my booth I took a tour of the show buildings. 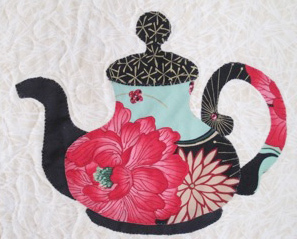 I came around a corner and was flabbergasted to see a beautiful quilt made from my first collection of teapot designs on special display against the wall. As I drew closer, I saw that this was a memorial area for two of the guild’s members who had passed away during the year. 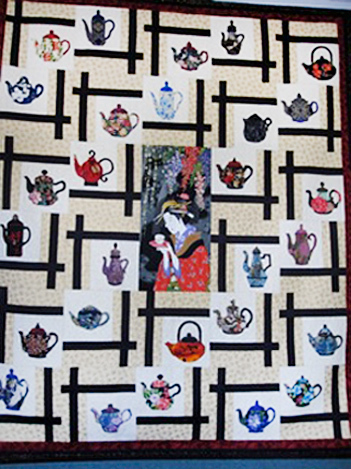 My heart filled up and I felt so honored that the daughter of the lovely lady who had made this teapot quilt had chosen it to represent her mother in the display. Her are some closeup shots of individual pots. 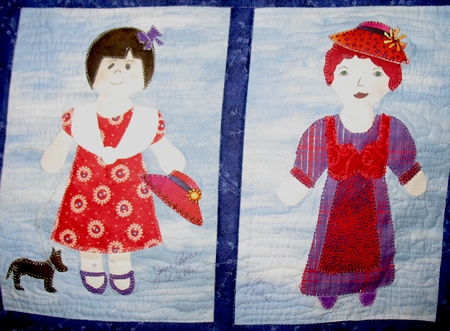 This lady had a very special collection of fabrics, I’d say! 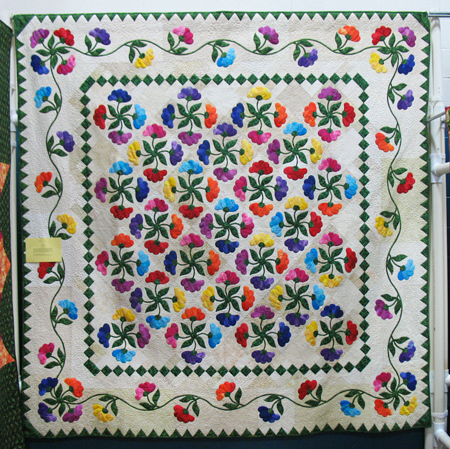 Thank you, Helen, and thanks to your daughter Nancy, and also to guild member Terry Matejcek, who helped me round up the information about the quilt and gave me permission to post the photos and the story.